Writing is hard work. It can take hours (or more!) to write a good piece of content. Wouldn’t it be nice if there was a way to turn that article into a hundred articles with little extra effort? There is it’s called content spinning. And it’s gross. Author’s note: this post begins with a rant and ends with a trick. If you’re looking for practical marketing advice, scroll past the “spun content is web spam” part. Content spinning is all about using a robot (software) to rewrite your article enough that another robot (Google) will think it’s a different article. It does this hundreds of times within minutes. The “new” content can be submitted to hundreds of blogs, usually with an SEO benefit in mind. Ridiculous, right? It can even be done using Google Translate. Just translate the article into German and then back to English a few times. Danke shoen for the new article, Google! It’s not future-proof. Even before the launch of Google+, there were rumors that Google was using social media activity as a ranking factor. Now with +1’s and personalized search results, social signals are well known to affect rankings. Spun content rarely sees any social shares, likes, or comments. It’s awful writing. Putting an article through the spin cycle is the fastest way to ruin a good post. All of this is bad news for content spinners. It’s time to retire the robotic rewrite and get real. Spinning is bad, but resourcefulness is good. If you know how to spin content by rewriting it from a different angle or in a different format, it’s actually a really good idea. Think back to your most successful piece of content. Now think of all the other ways you could deliver this message. Would it work well as a video? As an infographic? As a longer whitepaper or guide? As a more detailed series of shorter posts? Use the Periodic Table of Content as a guide for repurposing past content. Although your audience already read your advice on a topic, there are other blogs with other audiences that haven’t heard this point of view. And the research you put into the first piece doesn’t have to be repeated. See how each is a similar article but from a different perspective? You could probably write the second post quickly. It might be too closely related to the original to publish it on your site, but it might make a great guest post. Tip: Don’t just rewrite the same post with a new perspective. Add something new that the original didn’t include: new research, new ideas, or new perspective. The guest post can link to the original, which will help it rank in search engines. And both posts can take full advantage of Google Authorship, which is the “digital signature” that will make your picture appear in search results when either post ranks. 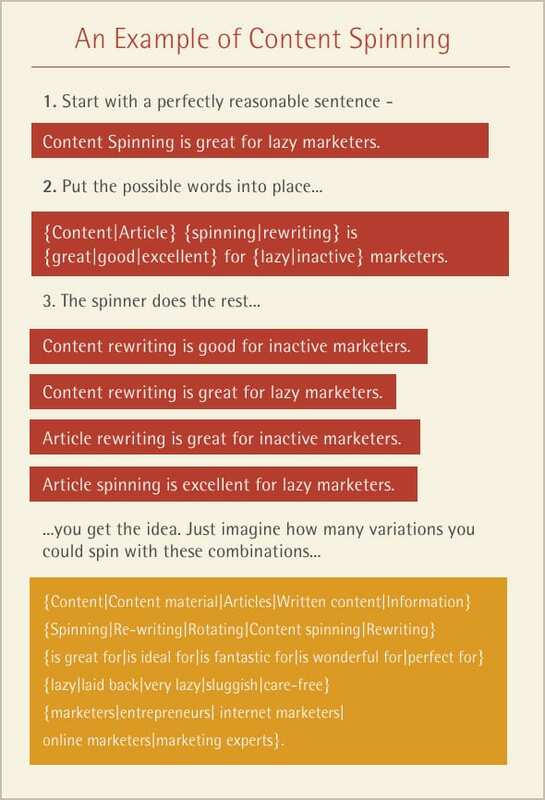 Now you know how to spin content, in good ways and bad. What do you think of article spinning? Am I recommending something unethical? Are there any redeeming qualities in automatically rewritten content? Great post, Andy. The content spinning thing kind of reminds me of how some firms in the past have stuffed far too many keywords into posts. What you get is keyword salad and it just makes for really bad writing for normal human beings to appreciate, regardless of how Google views it. I do think people often forget a couple of things: 1) Just because you post it once doesn’t mean that’s the only time you should post it. Think about how fast our various streams move. 2) As you mentioned, slicing and dicing content for various formats is also forgotten. I’m surprised by how often people just cut and paste a link in a bunch of locations rather than even giving it any kind of special intro. That’s a missed opportunity to create something unique to each channel while still utilizing one source. @Dan Gershenson We’ve all had our share of “keyword salads” It’s terrible writing. But I’m a big fan of re-posting in a different format or from a different angle. annhandley calls it “re-imagined” content. @crestodina @Dan Gershenson annhandley Sure wish there was a way to get folks who scrape punished Andy. I am guilty of not repurposing though. Thanks for the reminder. @Dan Gershenson You bring up a great point. Just as your refurbished or reimagined content should have a different perspective, the way you post it to different channels should reflect each channel’s inherent personality. I see so many business very lazily post the same article or blog post with the same sentence on multiple networks without a second thought. They’re missing out on a huge opportunity to cater their message to each respective channel. I like the trick at the end! In the little experience I have in writing articles, I find that I end up shifting my own writing perspective as I assemble the pieces. Sometimes that transforms the contents from positive to negative. If I go back to earlier drafts, I realize that the previous version could also work but the tone is so different. I wonder if it is common practice in journalism to produce multiple versions of a piece, then choose which has the right tone or slant to deliver the intended message best. In print, you tend to only get one shot at it. But in web marketing, it’s useful to repeat that message in a different tone or from a different perspective. Hey Andy Crestodina, Nice research for web content. Before some time (2 year) if spin articles and use for website promotion, definitely you get easy to ranking in google, yahoo or other search engines. But at this time all search engine strictly follow content policy at that time your article re-writing techniques best for web. Thanks for sharing this important idea. we all know that unethical SEO techniques are no useful for any website so try to not use that techniques. These are really useful tips to keep away from duplicate content. A lot of websites get penalized for duplicate content. Some softwares can be very useful to bypass any duplicate content filter. We just need to figure out that SEO is still a long-term strategy and needs helpful and readable content to become as efficient as possible ! Nice Post Andy, and love your writing style. I’m trying to figure out a way to get local telecom dealers some unique content on a regular basis for multiple websites, and I guess I’m just going to have to teach those guys how to write! At any rate, I have used spinning in the past and now I’m just banging out new content on multiple sites less frequently, but traffic has gone back up. Thanks for the reminder on spinning! Glad to hear this was a good reminder, Dean. It’s one of those tactics with a light side and a dark side. When done well, it’s fun, efficient and completely legit! It is always best to write all articles yourself, that way you have full control over the content. And if writing copy is not your forte, then hire a professional. Thank’s for your spinning guides. Without any tools if i rewrite from my own method is that helpful? Well, Rohit. If you’ll ask me, I’ll say it doesn’t matter until you are making it look like a spam, You may find it easily visible that some webmasters provide link to a certain webpage within the article in multiple numbers for often multiple anchor texts. So as long as you are not making it spammy, which means unnecessary addition of link with less relevance, it is okay to write multiple blog posts as guest posts. I am a professional manual Content Spinner. I can create 100s of spun pages and you will NOT even see its spun unless you put 2 pages next to each other and take a very close look. I rewrite sentences several times and only include synonyms that make sense. Don`t call content spinning low quality only because you have never seen it done right. Panda, Penguin and Humming word algorithm work continuously for google so be aware of black hat techniques. Is that Article spinning content regard as spam content? I expected it to be a blog post about content spinning software, which i feel sceptical about. Thank you for not living up to my expectations! I was surprised to find something really useful here. I especially liked the idea of reformatting old content and will definitely give it a try. best article on this subject I’ve read! Thanks, great tips that I will use!